Bill Wyman's Digital Daydreams is due for release on DVD on 7th November 2005, but thanks to Ben at classic Pictures we have a copy to review and a couple of copies to give away in as bonus prizes in our November web site Competition. You can also order a copy direct from www.classicpictures.co.uk (cheaper than Amazon). Well then what is Digital Daydreams? Bill Wyman purchased one of the first home computers to hit the UK and spent many hours using it to document his life and the history of the Rolling Stones. The movie deals with what his friends and loved ones see as his obsession with the computer. It takes a little while to get into the style of the movie as it mixes documentary with flash back scenes to Bill's childhood, fantasy with reality. There is a great quote from Richard O'Brien when he turns to a confused Wild West undertaker and says "It's an Art Movie!". This is a movie that is impossible to pidgeon-hole into one genre though. 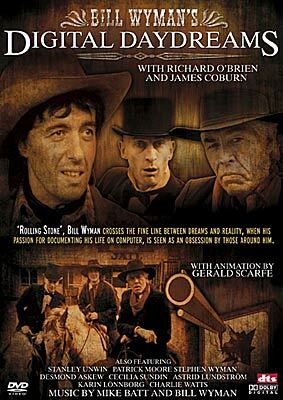 With music from Bill Wyman and Mike Batt, animations (and a performing role) from Gerald Scarfe (The Wall, Disney's Hercules movies amongst others) and staring roles from Richard O'Brien and the legendary James Coburn the movie moves from one time period to another, often overlapping characters from the years. The role of the young Bill Wyman is excellently played by Desmond Askew, little bit of trivia here...amongst his many acting credits Desmond played a character called "Gith" in an episode of the hit show Charmed. Also in the cast are Bill Wyman's girlfriend at the time Astrid and his son Stephen, along with Stanley Unwin (best known for his gibberish style of talking) and astronomer Sir Patrick Moore. Picture wise the movie stands up quite well for something originally made in 1983, the transfer from the original 35mm negative is not too bad although there are one of two scenes where they should have checked the gate for hairs a little more carefully. The Sound is great with both dolby digital 5.1 and DTS mixes included. Special features are limited to some nice animated menus and an interesting "Making Of" documentary featuring interviews with Bill Wyman, Gerald Scarfe, Mike Batt and Richard O'Brien. I watched the making of documentary before the film itself and it certainly helped explain some of the movie. When I first read the press releases for this movie I thought it may turn out to be the film version of vanity publishing, but I was more than pleasantly surprised by how well made the movie is, although there are points where the film seems to go off at a tangent the film remain coherent and held my interest to the final credits. The comedy aspects were great and you can't say Bill Wyman takes himself too seriously or has made this movie for self publicity only. I liked it. Watch our for Richard's Elvis impression, a classic moment. 'Rolling Stone', Bill Wyman crosses the fine line between dreams and reality when his passion for documenting his life on computer is seen as an obsession by those around him. A rich, full tapestry of the life and times of Bill Wyman through which are woven whimsical fantasy sequences, historical slices of his career with the world's greatest Rock 'n' Roll band ever, The Rolling Stones, and intimate psycho-dramatic glimpses behind the public mask of this superstar. A limited edition, of what was then known as the film Digital Dreams, was originally produced in 1983, following the massive Stones tours at the dawn of the eighties. Bill Wyman, already confirmed as the eternal archivist, purchased a computer that made him one of the first people in the UK to own an Apple home computer. It had just about enough memory to put half your address book on it Wyman jokes, but at the time it was quite magical and I started to enter my diaries and the whole history of the stones. He then began to recall more and more memories of his childhood, which ultimately provoked the concept for what was to become a full length feature film containing music, drama, comedy, fantasy, and historical content. It's a film laden with an all star cast led by none other than Bill himself, the late – great Hollywood legend James Coburn and the exceptional Richard O'Brien. References paying tribute to classics such as The Good, The Bad and the Ugly and Doctor Zhivago are also threaded into the screenplay. It never crossed my mind to get into some serious acting career, but it was fun to be able to get away with a few things says Wyman, it's all based on moments in my life, but in a tongue in cheek way, a slightly adapted life story, with some artistic licence of course. Speaking in somewhat of a reminiscent mood Bill adds I was able to get a lot of my favourite people of the time into the script; it's a glorified home movie, made just for fun. Playing alongside Bill is Astrid Lundström, the self proclaimed computer widow, and girlfriend of Bill Wyman for 16 years. We were actually in the process of breaking up while the film was being shot he explains, we had gone through some difficult times, and I thought we could do the film and pull it together but it didn't really work. Richard O'Brien, of The Rocky Horror Picture Show and Crystal Maze fame is heavily featured throughout the movie and also adopted the position of screenplay writer. I played a kind of butler figure, an orchestra leader, and a kind of strange horseback figure at one stage says O'Brien it's surreal, it's an art movie. Wyman adds further light to film making process by confirming It wasn't a script that was set in stone at all; it was very ad-libbed all the way through. Wyman recruited an eclectic group of fascinating personalities to complete the cast list in Digital Daydreams such as the late Stanley Unwin, well known for his gobbledy-gook speak, who famously glazed the Small Faces' Ogden's Nut Gone Flake album with his own inimitable narration and world famous astronomer and TV presenter Sir Patrick Moore. Scenes are lovingly connected with animation sequences from the expertise of Gerald The Wall Scarfe and complemented by wonderful themes and orchestrations from film score prodigy Mike Batt, performed by the London Symphony Orchestra. Additional tracks featured include the Stones' classics Satisfaction, Street fighting Man, Miss You, and Jumpin' Jack Flash. Rolling Stone, Charlie Watts and Stranglers member Jean Jacques Burnel feature briefly in scenes shot at the family home in Gedding, Suffolk, yet Wyman admits we didn't want to fill it with cameo parts its just so happens they were hanging around at the time. Un-earthed from Bill's archives over 20 years later, the film, now re-named, re-cut and re-mastered at Shepperton Film Studios, UK will surely provoke interest and intrigue for Music and Film fans on many levels.